If you have decided to go in for the granite countertop for the kitchen, then you can be sure of amazing build, elegant finish, awesome colour, and durability for many coming years. The granite ranges from light to dark colours and it is available in almost every trim that you can think of. This makes it really a very good choice for everyone and thanks to many available options; you can be sure of getting one matched perfectly with the decor of your house. As you already know, when it comes to the popularity, no other stone can beat granite in the countertop choice. This must have made you wonder, that why the granite is so much popular with every segment and what are the characteristic that makes it the first choice? In this article, we are going to give you some of the many benefits of granite, which will help you to make your decision easier. There is no denying the fact that granite looks amazing. No matter what colour you have chosen for the kitchen countertops, it always gives you a fresh new look every time you see it. As each of the granite slabs is different from the other, you get a stone that has a unique design and fabulous patterns. The gives you a very elegant texture finish and colour choices, where you can choose from the variety of shades on offer. This not only adds more depth to your home, but it also blends with almost every decor style. Don’t be surprised! Granite is affordable and contrary to popular belief, that it’s a stone choice for rich and wealthy, you can easily afford a granite stone for your kitchen. The increase in the popularity of the granite has lot to do with the affordability and people are now more towards getting granite for the kitchen countertops, than any other stone options in the market. 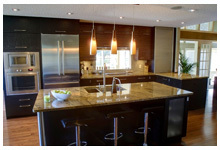 The price of the granite has dropped considerably in the recent years, making it within the reach for many people. Granite is by far the most durable stone you can buy for kitchen countertops. The surface of granite is very hard and it makes it user friendly, as you don’t have to worry about the scratches and dents on the surface. When you get the granite sealed properly, then it becomes heat resistant and stain resistant. However, it is recommended that you use the hot pads is there is too much of hot items usage in the kitchen. Thanks to the bullet proof durability, it also makes it kids friendly. As we have already said earlier, as no two granites are alike, it gives you a variety of options in the appearance. The colours on the surface of the granite run deep and each of the grains has a unique deep vein pattern that truly makes it stand out. When the light on the surface of the granite is reflected, you get to see the amazing patterns with elegant swirls and specks.